Ned Rozell | Geophysical Institute Feb 20, 2018. Aurora is space weather made visible. Photo by Ned Rozell. Viereck spoke about his job recently in his hometown of Fairbanks. His colleagues in Boulder use computer models, readings of Earth’s magnetism and spacecraft one million miles away to monitor blasts of solar radiation. They send out warnings to airline pilots, hopeful aurora viewers and managers of electrical grids. When a big solar storm happens, HF radios don’t work. Airline pilots use HF radio when flying over the North Pole, where there are no ground stations for line-of-sight operation. All the major airlines subscribe to forecasts from the Space Weather Prediction Center. When pilots know a big solar storm is predicted, they sometimes alter their routes. Snowplow drivers in places like Thompson Pass use GPS to keep them on the road when the world is white on white. And that wedding planner subscribes to solar storm warnings to make sure his doves, which navigate in part using the Earth’s magnetism, will return after they flap away. The “most critical” users of the center’s free forecasts are power grid managers, Viereck said. Spurious bursts from the sun soak power lines with induced current. Since most power grids operate at their capacity, managers dial down their output when they know a large solar storm is coming. “Every single power grid across the country is a customer,” Viereck said. Giant solar storms have not happened often, but one in March 1989 shut down Hydro-Quebec’s electricity transmission system, leaving six million people in the dark for nine hours. People in Texas and Florida saw red aurora during that event.Viereck mentioned the “Carrington Event” of 1859, when people in Cuba saw the aurora and those in Queensland, Australia, saw its mirror image. Telegraph systems around the world failed. Some equipment administered a mild shock to operators with their fingers on the controls. If a similar storm were to strike Earth today, “everything across the U.S. could be affected,” Viereck said. A solar storm of similar size to the Carrington Event just missed our planet in 2012. 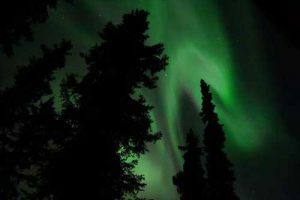 Viereck, who is 59, experienced many aurora nights as a boy growing up in Fairbanks, but he chose his career because he was good at math and physics and it seemed a natural path. In February 2018, he returned to Fairbanks to sell his mother’s house, cabin and car. She passed away in October 2017. When it was time to think about a career, Rodney looked above the trees. Admiring the people and camaraderie at UAF’s Geophysical Institute, he took a summer job there as a teenager, cataloging video from aurora-watching all-sky cameras. He liked that job. He soon became a graduate student and earned a degree in space physics. He remembers the seven years at the Geophysical Institute — from his first scientific job until the printing of his Ph.D. — as some of the best of his life. The Geophysical Institute exists in large part because of the aurora. In 1946, members of Congress voted to establish a “geophysical station” at a high latitude site, because something associated with the aurora was interfering with high-frequency radio signals.